Mount Pleasant Granary - Thursday 23rd. October, 2014 – Job done! Rose, showered, walked Mix and breakfasted with Mum and Tom in the farmhouse. David arrived and we started work on completing the floor. It took us until the middle of the afternoon, but we got it done. Rachel and Dorothy went off to their glass class and, at lunchtime, Tom, David and I went off to Pearsons where I bought a new butane cylinder for the heater in the summer house and David bought us lunch. By the time we returned to Mount Pleasant, Mum had gone off to the Gavinton Guild. 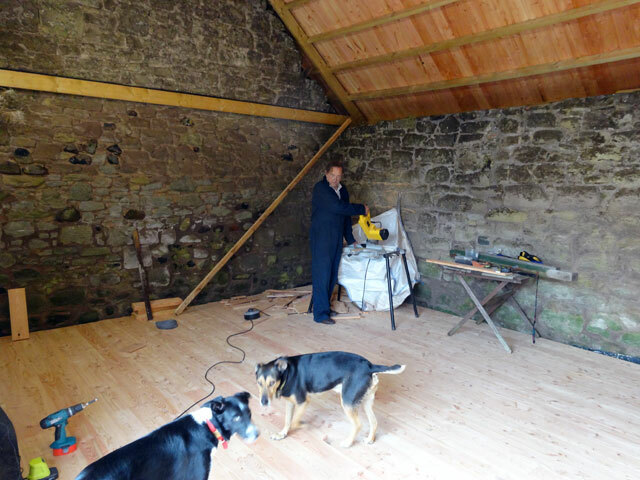 We completed the floor before Dorothy and Rachel returned at which point we all went our separate ways – I went into Duns to get some food for tea which we cooked and shared with Mum in the Granary before Rachel went off to her choir in Berwick. Then it was off to bed for an early night because we have a very early start to go down to Barnoldswick tomorrow. Walked Mix and retired to bed.